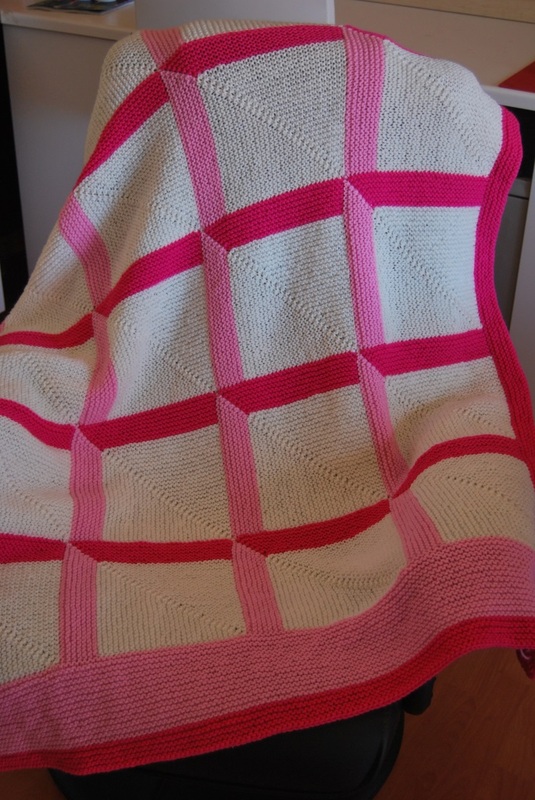 Try this pattern for my depth illusion baby blanket knitted in garter stitch. Although it is rated easy you will need to learn how to knit using two colours for the first 14 rows and how to pick up and knit stitches along the edges of your knitting. To make this blanket, you will need approximately 750 grams of 8 ply (double knit) yarn. You will also need 4.5 mm knitting needles (either 35 mm long single pointed needles or 1 circular needle). Bear in mind, you may have to adjust the needle size if your natural knitting tension does not match (or at least come close to) the tension specified below. A knitters sewing needle is also handy for sewing in loose ends where you have changed colour or joined in a new ball of yarn. 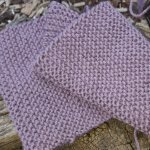 The knitting stitch pattern is a simple garter stitch (knit all rows). There is some shaping but you will not have to sew your blocks together - unless you really want to! I used Panda Magnum 8 Ply or Marvel Soft 8 ply for my blanket, but any reasonable quality 8 ply will do. Usually, I prefer to knit with natural fibres but for baby blankets I compromise and knit in acrylic or acrylic/nylon mixes to make washing easier for new mums. 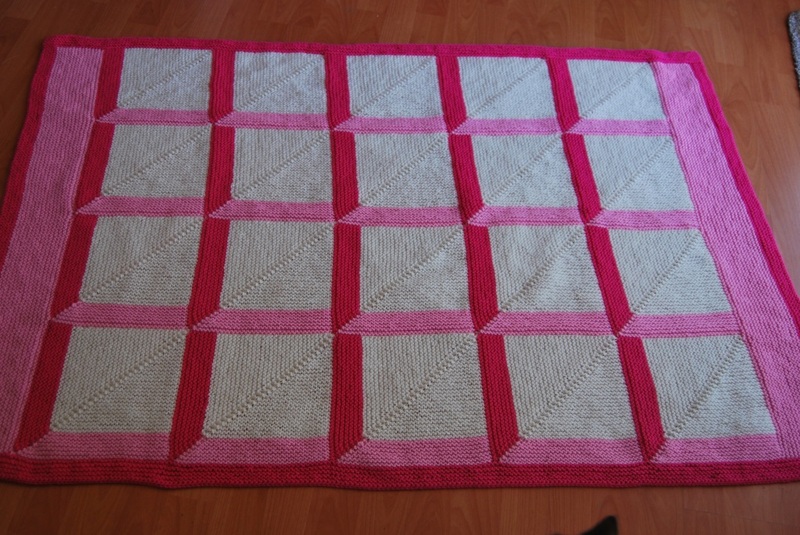 The finished size of this depth illusion baby blanket is approximately 95 cm wide by 135 cm long. To achieve that finished size, your tension needs to be 17 stitches and 34 rows per 10 centimetres. You can find out more about knitting tension squares on my page on how to knit a tension square. Cast on 37 stitches using C2, join C1 and cast on another 37 sts (74sts). 1st row: Using C1 knit to last 2 sts in this colour, k2 tog, change to C2 (and making sure you cross the yarn when changing colour) knit to end of row. 2nd row: Using C2 knit to last 2 sts in this colour, k2 tog, change to C1 (and making sure you cross the yarn when changing colour) knit to end of row. Repeat these two rows another 6 times (60 sts). Change to MC. Next row: Knit 28 sts, k2 tog, place marker, knit to end. Next row: Knit to 2 sts before marker, k2 tog, knit to end. Repeat last row until 2 sts remain. K2 tog and cast off. Using C1 cast on 37 sts, slip the second stitch on the right hand stitch up and over the first stitch, then pick up 37 sts along the right hand edge of the previous block (73 sts). Starting with second row, complete 2nd block as per the instructions for the first block above. Make another three blocks in the same way. 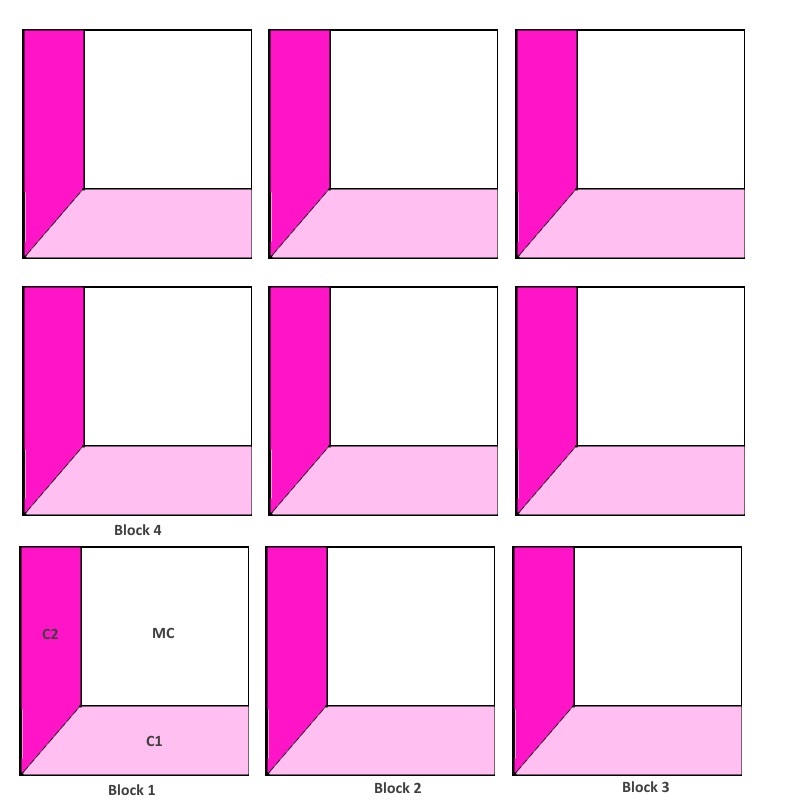 You should now have one row of blocks consisting of 5 blocks. Using C1 pick up 37 stitches along the top of the block below , slip the second stitch on the right hand stitch up and over the first stitch, then using C2 cast on 37 sts (73 sts). Starting with second row, complete the block as per the instructions for the first block above. Using C1 pick up 37 stitches along the top of the block below , slip the second stitch on the right hand stitch up and over the first stitch, then using C2 pick up 37 sts along the right hand edge of the block to the left of the block currently being worked(73 sts). Continue making new blocks until your blanket consists of 4 rows of 5 blocks each. Using C1 pick up and knit across the top of your depth illusion baby blanket (37 sts for each block) and knit 32 rows in garter stitch. Cast off. Repeat at the bottom of your blanket but do not cast off. Using C2 knit a further 10 rows in garter stitch. Cast off all but the last stitch, turn the work and pick up and knit stitches along the long side of the blanket (37 sts for each block). Knit 9 rows in garter stitch. Cast off all but the last stitch, and turn the work. Pick up and knit across the top of your blanket. Knit 9 rows. Cast off all but the last stitch, turn the work. Pick up and knit stitches along the long side of the blanket (37 sts for each block). Knit 9 rows in garter stitch. Using a knitter's sewing needle weave in all of the loose ends. The cot sized baby blanket is made using four rows each containing five blocks. Increasing or decreasing the size of your blanket is simply a matter of either increasing or decreasing the number of blocks. For a knee blanket, make four rows each with four blocks. For a cot blanket, make four rows each with five blocks. For a single bed blanket, make eight rows each with ten blocks. Just in case you would like to print out a copy of this Depth Illusion Blanket pattern, I have created a pdf version of it that you can download.